In honor of Dr. Goldstein’s recent honor from the International Congress of Oral Implantologists, we wanted to highlight a service that makes our Randolph office unique. A lot of dental offices restore dental implants, but at Dr. Goldstein’s, we can place and restore implants. A dentist who restores implants attaches crowns, bridges, or dentures to implants that have already been surgically placed and have had time to bond with the jaw. But a dentist who places and restores them can also perform the surgical procedure that’s needed before the restoration. Why is this good news for you? Because you can have your entire procedure finished under just one roof. Oftentimes, a dentist who only restores implants will have to send their patients to an oral surgeon who can do the procedure. Instead, you can trust us to complete your whole procedure, from start to finish, in our comfortable, familiar office. Two visits are typically all it takes to complete a dental implant procedure. During the first, Dr. Goldstein will place you implant(s) in your jawbone. Then, after the implant has had time to fuse with your bone tissue, you’ll come back to our Randolph office to have your procedure finished and your new smile put in place. 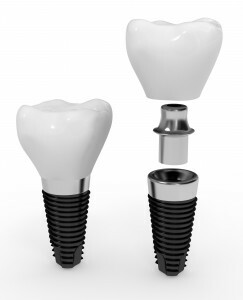 Do you have questions about how dental implants? Visit our dental implants page or call our Randolph office to schedule a consultation appointment with us. Dr. Goldstein serves patients from Randolph, Rockaway, Mendham, Chester, Morristown, Denville, Morris County, and beyond.